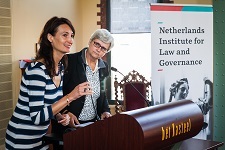 On Thursday 18 September and Friday 19 September, the 6th Annual Conference of the Netherlands Institute for Law and Governance on “Comparative Law and Governance” took place in Het Kasteel in Groningen. Prof. Sjef Van Erp (Maastricht University) and Prof. Aurelia Colombi Ciacchi (University of Groningen) opened the conference with their joint presentation on comparative law in the age of governance. 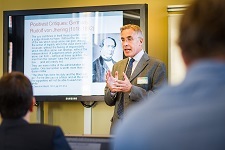 Prof. Van Erp described recent transformations of comparative law and pointed at problems and dangers connected with the use of comparative law as an instrument for the pursuit of a particular aim or policy, such as legal harmonisation or the fostering of the Internal Market. Prof. Colombi Ciacchi considered the meaning of governance, and described law and governance as a new academic discipline that should lead to a new tri-dimensional method of comparison, including external comparison, internal comparison, and good governance comparison. Prof. Boele-Woelki (Utrecht University) discussed the possibility and necessity to combine comparative legal research in family law with comparative research in other disciplines. She made some examples of such combined comparative research, distinguishing between restricted comparative research and synchronized comparative research, and pointing out at typical obstacles to synchronized comparative research. Prof. Bohlander (Durham University) analysed the relationship between the discourses in secular and Islamic legal thinking and the lack of conversation between them. He proposed to use Maqāṣid al-Shari‘ah (the Higher Intents of Islamic Law) and principles of secular law to advance dialogue that may reveal that these systems are not as different as critics like to proclaim. 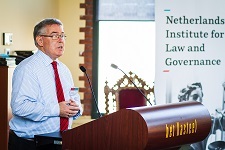 Finally, Hans van der Meij (Brill Publishing), presented the European Journal of Comparative Law and Governance (EJCL), a new academic journal of the NILG published by Brill, founded by Prof. van Erp and Prof. Colombi Ciacchi, and devoted to the new discipline of comparative law and governance. Prof. Harm Schepel (University of Kent) discussed failed attempts to extend ‘Good Samaritan’ liability (the duty of care of a person who undertakes to provide protective services to another) to multinationals in the context of contractual governance of supply chains. He argued that principles of tort law should sustain the weight of functioning as private global administrative law. Prof. Gert Brüggemeier (University of Bremen) presented a critical analysis of the CJEU decision in the Tarmo Lehtinen case on state liability. He argued that the Court introduced a new type of semi-vicarious EU State liability unknown to both Member States law and ECHR law, and missed a chance to balance the fundamental freedom of the manufacturer against the civil servant’s fundamental right of freedom of expression. Dr. Dorota Leczykiewicz (University of Oxford) compared national and European judicial governance structures with regard to contractual liability, using the concept of ‘judicial intervention’ to discover the motives of the Court of Justice in reviewing the content of contracts. Prof. Peter Rott (University of Kassel) explored the liability of certification agencies for defect products in the light of the PIP-cases. The claims for damages against the certification agency led to opposite decisions in France and Germany. 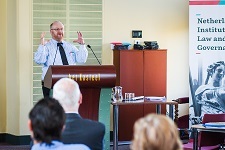 Prof. Rott compared the reasoning of the courts and explained why tort liability should complement private certification. Prof. Salvatore Patti (Sapienza University, Rome) analysed Italian criminal and civil law against intra-family violence. After a brief historical overview of the outdated doctrines on the unity of spouses and immunity of spouses for both civil and criminal liability, Prof. Patti discussed national, European and international family law reforms to combat domestic violence. He argued that notwithstanding these measures, there has been a dramatic increase of intra-family violence, especially cases of killings of wives and partners. Dr. Patrick O’Callaghan discussed the right to be forgotten in the light of the recent decision of the Court of Justice in Google Spain. He argued that even though policies promoting the “forgetting” are associated with dictatorial regimes, the right to forget is very useful because it offers individuals a chance to start afresh. Accordingly, this right can be found in various areas of law, ranging from criminal law to bankruptcy law, and has proven important for social well-being in cases where old facts hindered people from making a new start. 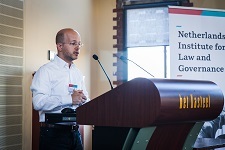 Dr. Nuno Ferreira (University of Liverpool) argued that applying general tort law to children’s cases can result in damages being imposed upon children who become overindebted before they have even built a life. After having compared the solutions of different European countries, he proposed a framework in which liability is differentiated according to the children´s age and gradually allowed as children mature. Dr. Ferreira further argued that fundamental rights discourse should impact the shaping of tort law, which generally has proven flexible and able to adapt to society’s and economy’s demands, with more attention for tortfeasors’ rights. .
Prof. Christine Godt (Carl von Ossietzky University Oldenburg) discussed liability for ship collisions in international waters. From a comparative law viewpoint she observed the mixed jurisdiction nature of maritime law, which is a mixed set of national and international rules, derived of various legal traditions. Prof. Leon Verstappen (University of Groningen) emphasised the importance of expropriation across borders and proposed a reconceptualization of expropriation. He questioned the notion of “public” interest (which outweigh the right to property in cases of expropriation) and discussed judicial review, participation of the public in expropriation procedures, and fair compensation. Prof. Gregory Alexander (Cornell Law School), revolved around the question of how expropriation fits into a human flourishing theory of property. Prof. Alexander discussed this theory as an alternative to public use evaluation, which has proven controversial in the U.S. He defended an explanation of power to expropriate by the duty of private owners to enable members of their communities to develop capabilities crucial to human flourishing, asking what this obligation requires of private owners with regard to the state’s power to expropriate. Prof. Hanri Mostert (University of Cape Town) questioned the extent to which the state can, should, or must interfere with proprietary rights that pertain to natural resources. She sketched two regimes that form the basis for the regulation of exploitation of natural resources and issues of ownership arising from mineral exploitation. Although differences remain, far-reaching statutory regulation seeks to guarantee sustainable and socio-economically responsible extraction. In this light, Prof. Mostert explored the notion of custodianship of natural resources and pointed at the need for further research in order to give content to this notion. 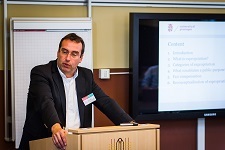 Mr. Björn Hoops LLM (University of Groningen) discussed the definition of the public good requirement in expropriation law. He sketched a framework for defining this requirement in various jurisdictions, including Germany, South Africa, and the U.S. His comparison included a comparative analysis of the different, distinct governance models that accord different degrees of freedom to state bodies in defining and applying the public good requirement. 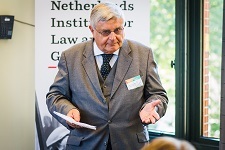 Prof. Jacques Sluysmans subsequently considered expropriation in the light of the demands of good governance, which is difficult to define but includes administrative safeguards. He turned to ECHR case law, which has already addressed good governance in the light of the right a fair procedure (article 6 ECHR) and the right to property (article 1 Protocol 1 ECHR). Within this framework, Prof. Sluysmans explored whether or not a deprivation of property is fair. Dr. Carola Glinski (University of Bremen) discussed regulatory expropriation. She argued that a comparison of the protection of property and legitimate expectations under the Grundgesetz and under international investment treaties showed that German law only provides for compensation for lawful constraints to the use of private property in exceptional cases, whereas international investment law takes the “legitimate expectations” of the investor as a starting point, without holding the investor responsible for related legal and social obligation. Dr. Glinski set out why arguments justifying this difference raise more democratic problems than they solve. Prof. Wolfgang Schomburg (Durham University) considered two principles that ought to be reconciled: the need for criminal law to reflect the cultural background of societies, and the need for legal certainty. At the national, European and the international level, there is a tension between accommodating cultural diversity and being clear about what is criminal or not. Current controversies make clear that diversity should not lead to accepting questionable practices. Prof. Schomburg warned against intentionally vague criminal laws, as persons must be able to know which acts are criminal and which are not. He also argued that the introduction of mutual recognition and harmonisation of criminal law may jeopardize legal diversity. Prof. Liling Yue (University of Beijing) discussed the sentencing policy and the practice of death penalty in China. Although China seems to be handing out less death penalties, public support for death penalties continues to be strong. Although guidelines for judges have been issued, problems remain, three of them being a lack of alternatives to imprisonment, discretionary powers of judges being too large and a remaining inequality in imposing punishment. Dr. Nazand Begikhani (University of Bristol) discussed honour based crimes in Kurdistan, emphasizing many social, economic and political changes in Iraqi Kurdish society, and a clash between conservative and modernizing forces. Although legal reform resulted in positive outcomes, the implementation of reformed laws has been challenged by socio-cultural boundaries and irresponsible institutional practices. In the face of these difficulties, involved parties have turned to “Solhi Ashayri”, an alternative legal remedy, consisting of informal law and supported by tribal mode of governance and intervention. Dr. Murat Önok (Koç University) discussed the strict exclusion of evidence obtained through illegal methods. The Turkish Constitution adopted this principle in order to discipline law enforcement officials and to guarantee the protection of the defendants’ human rights. In the light of the gap between this provision and practice, Dr. Önok discussed whether the existence of idealistic and strict, yet not easily practicable rules is efficient or not in protecting human rights. 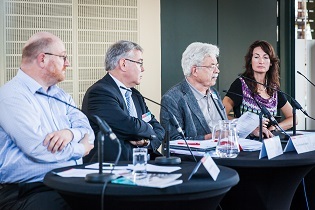 Prof. Richard Vogler (University of Sussex) argued that for both practical and theoretical reasons, direct democratic participation should play a significant role in the evolving notion of European criminal justice. He compared different modes of public participation throughout the Union and pleaded for more popular participation in criminal proceedings, which provides an important counterweight to the increasingly authoritarian tendencies of contemporary European criminal justice. 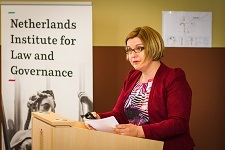 Nicole Siller, JD (University of Groningen) analysed the prosecution of human trafficking at the international level. She described how, despite of the absence of the criminal offence of ´human trafficking´ in the statutes of international courts and tribunals, this crime plays a role in the practice of these judicial institutions. A comparative analysis reveals instances where the establishment of guilt of offenders charged with various exploitative crimes (e.g. enslavement, child soldiering and sexual offenses) often materializes on the converging characteristics of human trafficking. Against this background, Ms. Siller raised the question of whether human trafficking should be established as a distinct crime in the statutes of international courts and tribunals. Three eminent scholars summarised the parallel sessions and presented their own reflections thereon. Prof. Norbert Reich emphasized the new accent that the session on Comparative Liability Law and Societal Governance gave to existing topics. He considered three general issues suitable for future discussions: (1) compensating for tort liability, (2) preventing harm, and (3) reshaping of concepts. 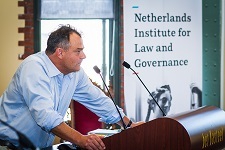 In his report on the sessions on Expropriation Law and Governance, Prof. Sjef van Erp paid particular attention to the comparison between the South African approach on the one hand, and the approaches of European countries and the ECHR on the other, towards procedural and substantive questions relating to expropriation. Thereby he highlighted in particular the diversity of approaches with regard to the definition of expropriation and ownership. Prof. Michael Bohlander identified three challenging issues that arose during the Criminal Law and Societal Governance sessions: firstly, diversity within criminal legal systems, and the danger of national guarantees of different countries being eroded by harmonisation and the lowest common denominator; secondly, the form and function of criminal law; and thirdly, the difference between pretense and reality. He suggested that good governance in criminal law could form the basis for a further avenue of research.